A one-minute application etches porcelain crowns, veneers, inlays, and fractured porcelain surfaces prior to bonding. 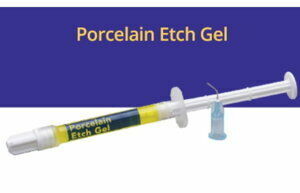 This superior quality porcelain etch gel will not stain porcelain, composites or resin cement. Porcelain Etch Gel Kit Contains: 4 - 1.2ml syringes Etch Gel; 8 dispenser tips.